Running the Race: The end of an era? I'm writing this with a heavy heart, but I guess it's time to face the facts: I think we've come to the end of our stroller running era. I've been in denial about it for a while now, but it's getting kind of hard to ignore: What started off as the occasional request from Miss K to get out of the stroller mid-run, has now become the rule - she wants to run and explore by herself. And what started off as a groan or two from J Bear, has turned into arched back, flailing arm protests. He also wants out. I remember Miss K and my first stroller run, more than three years ago, so well: I was terrified that she'd hate it, but soon discovered, to my delight, that she loved it just as much as I did. We spent hours chatting and running along the leafy paths of the local botanical gardens - and loved it! Picnic in the park after our very first stroller run. Miss K was just a tiny little thing! 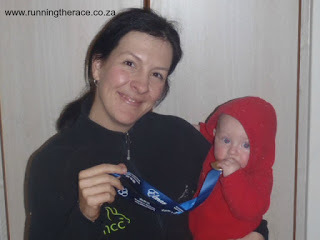 And then came our first stroller race - a 5 km fun run when Miss K was six months old. We both fuelled with apple and cranberry baby food pre-race and clocked a respectable 26:49 - it feels like it was only yesterday. As Miss K grew older, our stroller runs got longer and longer - with 16 km being our longest one to date. We spent it chatting and singing and snacking (Miss K) and huffing (me) - ahhhhhhh, the memories...! And then, of course, J Bear made his appearance. I was once again terrified that they'd both hate the double jogging stroller and postponed our first double stroller outing for way too long. But, just like that first single stroller run with Miss K, it went great. They were both fast asleep in the blink of an eye and so began our double stroller journey. Our first double stroller outing when J Bear was three weeks old. At the inaugural Hartenbos parkrun. Awww, the laughs and the memories...! But, this chapter is sadly coming to an end for us. And so it should be, right? The kids are growing up and exciting new adventures are waiting up ahead. So thankful for this chapter of fun and laughter I've had with the ones I love! Cannot wait for reading about their first race. I remember again my son's first running race 30 years ago. If ever they want to try it, it will be an awesome day for sure!